This article reproduces an edited excerpt of Descriptive Cataloging of Rare Materials (Books) (usually referred to as DCRM(B)) concerning signature statements in catalog records, along with (eventually) notes and observations on Folger practice. 7B9.1. General rule. Make a note giving details of the signatures of a volume, if considered important. Give these signature details according to the formula in Philip Gaskell's A New Introduction to Bibliography (see p. 328-332), as limited by standard MARC character sets. Preface this note with the word “Signatures” and a colon. 7B9.2. Unavailable characters. 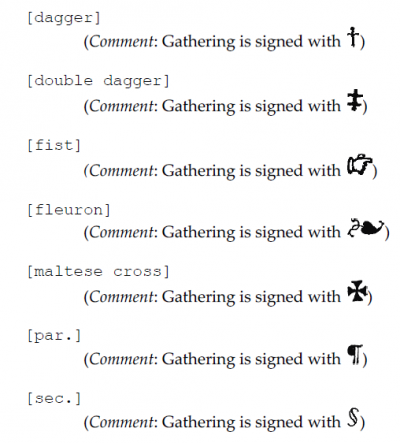 If the gatherings are signed with a mark of contraction (see 0G8.2, Appendix G3) that cannot be reproduced using available typographical facilities, substitute the spelled out form and enclose it in square brackets. If the gatherings are signed with other unavailable characters, substitute a descriptive term or an abbreviation for that term if a standard one exists. 7B9.3. Special uses of pi and chi. Indicate unsigned leaves that fall outside the signature sequence (see Gaskell, p. 330) by using the words pi and chi. Do not enclose the words in square brackets. Do not use the Greek characters π and χ, as these will give the impression that the leaves have actually been signed with Greek letters (see 7B9.9). 7B9.4. Non-conventional Latin alphabet. If the gatherings are signed with roman letters according to a pattern other than the conventional 23-letter Latin alphabet (i.e., A-Z, less I or J, U or V, and W; common with American printers), make this explicit by separately recording the additional signatures in the signature statement. 7B9.5. Signatures do not match gatherings. If it can be determined that the signing of the volume does not match its actual gatherings, indicate this in the note. 7B9.6. Concurrent signatures. If the volume is signed using two concurrent sequences, provide both sets of signatures in the note. Give the signatures that correspond to the actual gatherings first, if this can be determined. Provide signature statements for all books of the hand-press era. Rare exceptions may be made when the resource's signatures vis-à-vis pagination are so erratic or complex as to prohibit completion of description within a reasonable time frame. Provide signature statements for machine-press books, when present and described according to DCRM(B). Provide full statements of extent and signature statements in notes for individual volumes of multi-volume sets. Make sure the count of pages or leaves according to statement of extent (300$a) equals the count of pages or leaves according to the signature statement. This page was last edited on 13 April 2019, at 09:17.